I had some friends over for lunch yesterday. 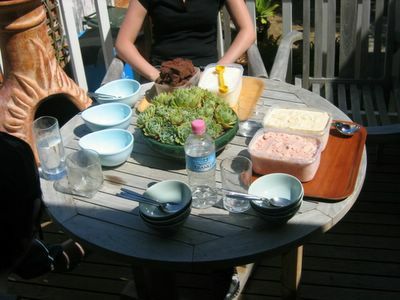 It was a lovely sunny day, and we ate out in the garden. I made a few platters of food, and let everyone pick what they wanted. Easy! We had an Italian-style antipasto lunch, followed by ice-cream. 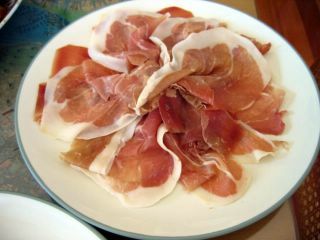 I bought the prosciutto, olives and cheese from Cardamone's fabulous Italian supermarket on Station street, Fairfield, and prepared the rest of the food myself. All the food was cooked on the BBQ (aka The Beefmaster 3000), and I got to work barbecueing about an hour before my lunch was scheduled, and my friends started arriving just as I finished grilling. For the bruschetta, I sliced 2 loaves of light rye sourdough, and grilled them on the BBQ until -marked on each side, and drizzled them with extra-virgin olive oil and salt. 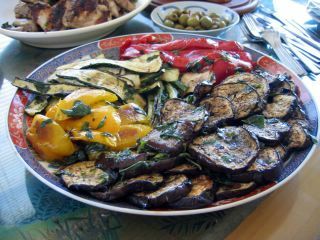 Jamie's grilled vegetable recipe includes red and yellow capsicum, zucchini, baby leeks, fennel and eggplant. Fennel's out of season, so I left it out, and I've never seen a baby leek, so I used spring onions. 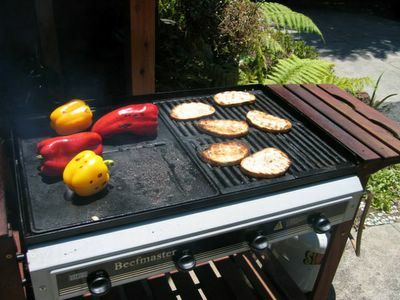 The capsicum you grill whole until it's black, then let it cool and peel and deseed it. The rest of the vegetables simply need to be sliced and then grilled. Once the vegetables were done, I drizzled them with a mixture of basil, olive oil, garlic and salt, which I had combined with a pestle and mortar earlier. Next was the chicken wings. To prepare them for the BBQ, the chicken wings had been marinated overnight in lemon juice, olive oil, peppercorns and salt. 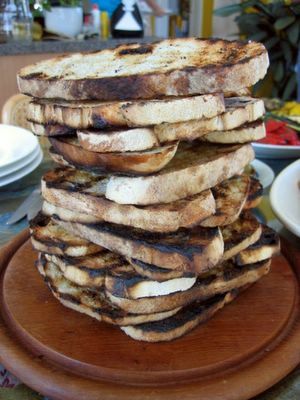 They took about 10 minutes on each side to be cooked - it was such an effort to cook them on the BBQ, standing in the hot sun, no beer in hand. (I had to drive later that night). Phew!! Next time it's the oven! After a lot of grilling and some very attractive tan lines on my feet, lunch was ready. Platter of mixed grilled vegetables. (In the book, Jamie mixes them up, but I preferred to keep them separate). I set up all the food inside (didn't want it to go funny because of the bright sun), we took it and ate on the porch. Lovely! Now we get to the ice-cream. I served 4 ice-creams, which I had made at various points throughout the week. 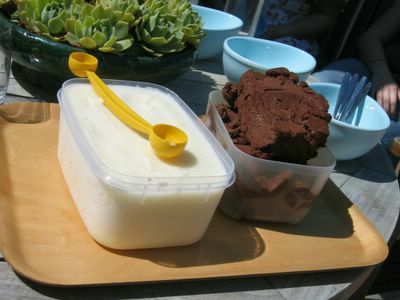 It's not possible for me to make more than one ice-cream a day, because my ice-cream maker only holds 1 litre, and because the speedie-freeze bowl can only be used once before it needs to be washed and re-frozen, ready for the next batch of ice-cream. 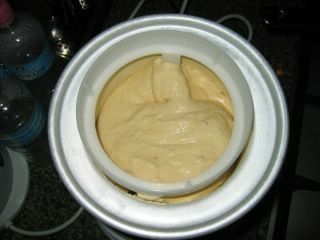 There are several ways you can make an ice-cream base, but essentially you make up a custard (i.e. beaten egg yolks and sugar, combined with hot cream or milk) and slowly cook it over a low heat until it thickens. 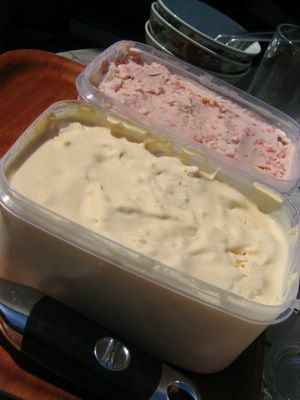 Then you can add your flavourings and churn it for 15 minutes, before transferring it to the freezer to freeze completely. The peanut butter ice-cream has peanut butter and sour cream folded through, the strawberry ice-cream has (funnily enough) puréed strawberries, and the baci has nutella, cocoa, melted chocolate and hazelnut syrup. I doubled the quantity of hazelnut syrup because I felt the hazelnut flavour was not pronounced enough upon tasting it. The vanilla gelato is a bit different, however. It is simply milk, vanilla extract and sugar, which you combine and then churn. vanilla gelato, baci ice-cream. 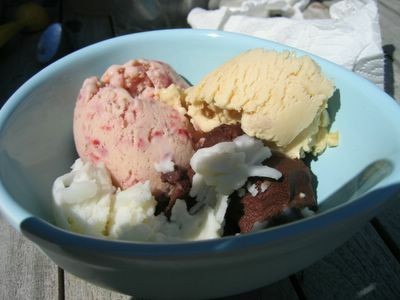 Mum had the idea of making a bowl of multicololured mini-scoops with that yellow scooper, which would have looked wonderful, but the ice-cream was too hard straight out of the freezer to do so. And more importantly, we were all impatient to eat the ice-cream! The baci ice-cream was delicious, so velvety and chocolatey. 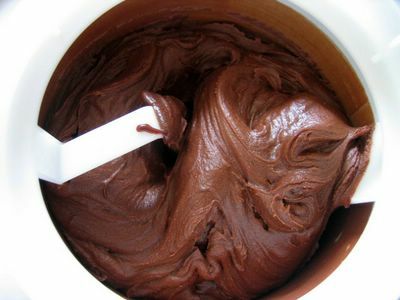 Just like frozen nutella. The recipe only makes about 750ml, but that is ok because it is incredibly rich! A teensy scoop is more than enough. The peanut butter ice-cream is as good as it sounds, smooth and with a strong peanut taste. However, I would have liked some crunch in there, perhaps with some roasted peanuts or peanut brittle (just like the Peanut Nutter flavour at Trampoline - best ice-cream store EVER!). As you can see in the photo, the vanilla gelato didn't really scoop properly as it was very icy. It still tasted good, very light and refreshing, and a great foil against the super-rich peanut butter and chocolate ice-cream. The strawberry, however, was just divine. Real strawberry ice-cream is my favourite flavour. Especially Häagen-Dazs' strawberry, eaten out of a little tub with a wooden spoon whilst on holiday in Malaysia, lounging on a deckchair and getting nicely tanned. Nigella's one tastes very "Wimbledon" - fresh strawberries and cream, frozen into a bowl of pure deliciousness. Heavenly. My friends said that the strawberry-baci combination was the best, and I'd definitely agree. OOOh they look delicious! The baci is to die for, and I love the strawberry one too, so pure tasting... bravo!!! absolutely beautiful food! there's nothing like eating al fresco to work up an appetite! 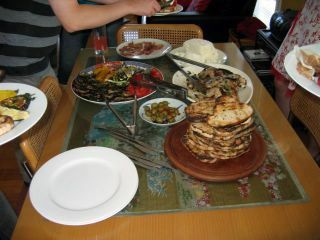 It was a truly delicious lunch and all round excellent Sunday afternoon. The baci strawberry icecream combination is certainly a winner. Hi Sarah :) I have just realised that you are still blogging after HTE! Duh! Your food is as amazing as always. 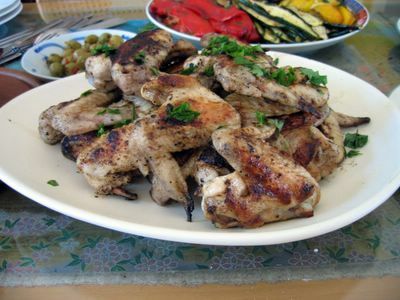 I have had Iced on my wishlist for a while now, but I have now ordered it along with Everyday by Bill - that lemon chicken and rice looked so good!! Looking forward to reading your blog again!